You stick him with the pointy part. Different types of blades were used in different ways. Let’s look at a typical one-handed medieval sword. It’s main weapon was its edge, not it’s point. The point wasn’t really used a lot during the middle ages. Armor stopped it. Big heavy swords were used more for smashing and hacking. Still for swordplay know that there are two ends of a sword one with a pommel (heavy enough to counter balance the blade and to smash into things like people’s faces) and the other with our famous point. The cross guard is nice for stopping opposing blades from sliding down and cutting your fingers off but also wonderful for punching into the face. You’ll notice a theme here. Pommel to dross-guard is the hilt. The blade has two parts a forte (or strong) bottom third closest to your cross-guard that is used to parry or block your opponents strikes and a foible (or weak) upper third for cutting your opponents in half. The sharp edge can be on both sides (two true edges) or one in which case the blunt side is called a false edge. 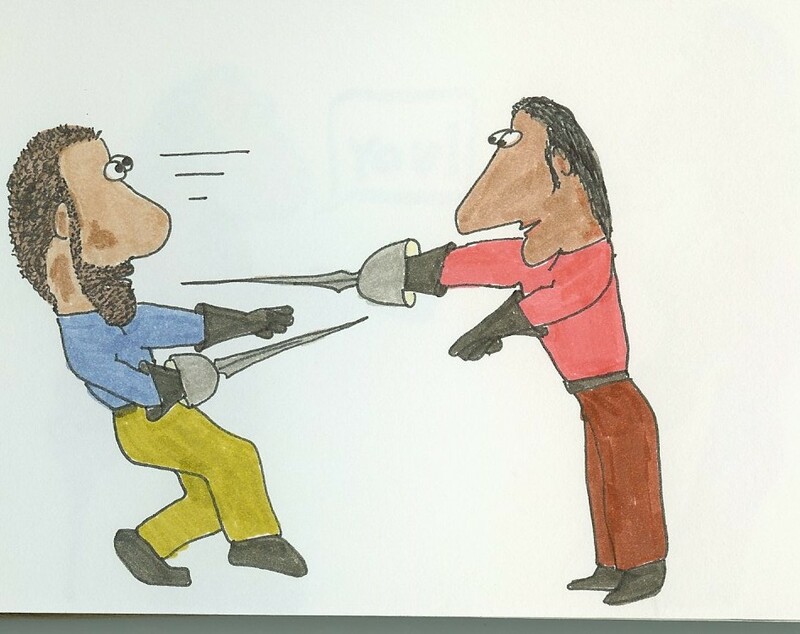 Rob Roy – the final duel between Rob Roy and the English antagonist is a duels between the past (a large two-handed claymore – which is a heavy hacking edged weapon) and the present (a long, thin, pointy small sword that uses the point to do damage). This is choreographed by famous English fight choreographer William Hobbs. These two characters fight the way their personalities tell them to. The fighting is not generic, it is character-based. A good lesson for all writer’s to learn. Watch any of the fights in Game of Thrones and then watch the scenes of Arya training with Syrio. Two-handed medieval broadswords are weapons of strength while Arya’s Needle is more point than edge (swords from two very different time periods but hey, it’s a fantasy novel so you can do whatever you want!). This entry was posted on April 2, 2013 by Joe Lunievicz. It was filed under A-Z Challenge, Blog, Fencing, Films with Swords, On Writing, Stage Combat . Fencing, would love to take lessons. My grandson does and he enjoys it and does quite well–inspiration from the books he reads. Visiting your blog from A-Z. Nice post! I love when I come along a blog where I learn something new. i never knew that one side of a sword may not be that sharp compared to the other side! shows how much I know, huh?! lol. very interesting! I remember watching Rob Roy after first getting to know you. Yup. And this fight in particular is worth studying because technically it’s just soooooo good.